We lost our first little pooch, Kandey after 9 great years with her. My husband, Cliff, & I had so much fun with Kandey. She was a real dress up dog, always had to have something on before she would go out. She was so much a part of our life, we even bought a 5th wheel trailer so we could take her on holidays with us. Our home was so quiet and sad, with camping season coming up, we decided we needed another pet. Not a replacement, a dog that was totally different, one that would not tempt us to compare the new to the old. I came up with this great idea, we’ll find two dogs! If we had so much fun with Kandey, we could have twice the fun with two. We could go out as a “family” and each have a dog to walk. 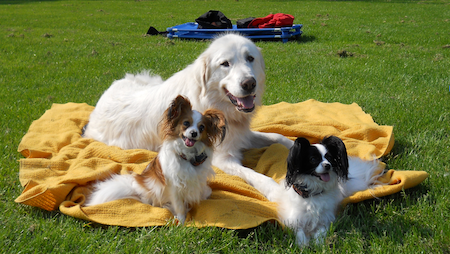 After researching different dogs, the Papillion seemed to fit what we were looking for, small, easy care coat, clever and good companion. I called a breeder and to my delight she had two she would sell to me, a boy and a girl. Perfect, I thought! I went straight out to see the puppies, and brought home Dixy & Oskir that night. The first few days were great, they were so cute and easy to handle. However, it didn’t take long until they realized they could do pretty much as they pleased! They are very fast, and, they can go in two different directions. Trying to house train them was something else. They seemed to prefer our white carpet to the outdoors. Within two weeks, Cliff didn’t want anything to do with them, and I had to go back to work. I knew I was way over my head. I had no idea how to train one dog, let alone, two dogs, or even how to take two to a training class. I didn’t realize two dogs were so much harder to handle, you can’t pick them both up, they wiggle too much, or else they think it’s a game and run as fast as they can, in opposite directions. The wonderful thing that I learned was how to train my dogs, and why they did some of the things they did. Within a very short time we had two fun, controlled, happy friends. A girl friend at work could tell I was in trouble and she told me about a trainer that her daughter had used, Sit Happens. They had a doodle, Lizzie, a fun loving out of control girl until Sit Happens. 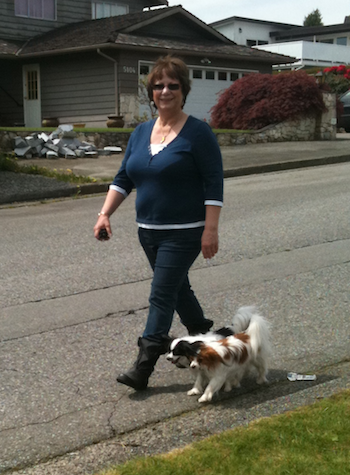 In a short period of time Lizzie was listening and a treat to take out for a walk. I did the best thing ever; I called Jeff at Sit Happens and set up an appointment. Sit Happens was scheduled to come in a week, which was the longest week ever; I could hardly wait for them to arrive! 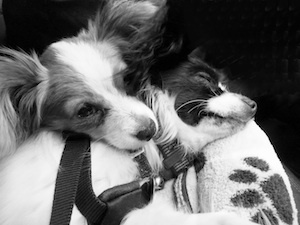 I instantly loved them and their little Papillion, Flirt. They helped me so much that first day, I will be forever grateful. Dixy and Oskir were fast learners…and faster than I would believe they starting behaving. The wonderful thing that I learned was how to train my dogs, and why they did some of the things they did. They really thought they should pee on the carpet, because I was training them on a pee pad, so they didn’t know the difference! The things I learned from them amazed me! Within a very short time we had two fun, controlled, happy friends. Our little boy, Oskir, was very timid. I didn’t realize it was such a problem, but thankfully, they did. The trainer was kind enough to take him home for a few days, and socialize him in all sorts of different situations. When he came back, he was so much better at handling himself, and they taught me not baby him. Dixy & Oskir are now such a pleasure. When I get ready for work they listen to me, and follow me until I’m ready to leave, I tell them to go to their crate, they run in and wait for me close the crate door. They are better then I ever thought possible, they are just so much fun. I haven’t met anyone that was not impressed with how well they behave. Even my Mom & Dad (non dog folks), enjoy them, and are amazed at how well they listen. They are better then I ever thought possible, they are just so much fun. I haven’t met anyone that was not impressed with how well they behave. We love going to training it is always such a positive experience, we met great people and good dogs! They do an awesome job of controlling the entire group, trainers and dogs, each session, and how they remember all the names is a mystery! With our first and only other dog, Kandey, I took her to puppy training, intermediate training and advanced training. She would behave in class, or not, depending on how she felt, and rarely would she do as I asked, out side of class. For the 9 years that we had her, I was never able to open the front door, with out picking her up, or she would be down the road. She was always on a leash outside, which makes me feel bad when I think back. Dixy & Oskir have a much better life, thanks to Sit Happens. I am so grateful for the Sit Happens; for the hard work that they do to ensure all dogs and owners are on the right track, and are happy working and playing together. Thank you for all the pleasure you have brought to us.